Boehner And Cruz, And Lew Too: Voices On The Shutdown : The Two-Way With a government shutdown nearing its second week, there were no signs of a new deal in Washington Sunday. But several leaders are speaking out about the impasse, even as they look ahead to the next battle: an Oct. 17 deadline to raise the U.S. debt ceiling. 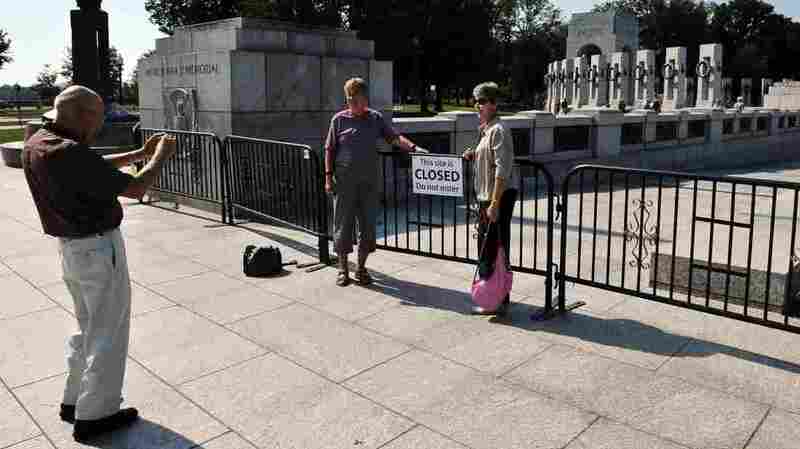 On the sixth day of a federal government shutdown that has barricaded national parks and attractions, tourists take photos at the World World II Memorial in Washington Sunday. With a government shutdown nearing its second week, there were no signs of a new deal in Washington Sunday. But several leaders are speaking out about the impasse, even as they look ahead to the next battle: an Oct. 17 deadline to raise the U.S. debt ceiling. When House Speaker John Boehner was asked on ABC's This Week about the possibility that he might present a "clean" funding bill that doesn't attack the new health care system in the Affordable Care Act, the Ohio Republican said there was no point. "There are not the votes in the House to pass a clean CR." Boehner told ABC's George Stephanopoulos. "Are you sure that's true?" Stephanopoulos asked. "The Democrats say they have 195 Democrats who have already signed a letter saying that they would vote it. 21 Republicans, 21 House Republicans have said they are for it, as well. And Democrats are confident, you add those Republicans to the Democrats, a few more would come along and they have the votes." That view was also aired by President Obama in a recent interview, in which he said the shutdown could be over already if a clean bill had been presented. The president also warned against the nation becoming a "deadbeat" by defaulting on its obligations. Boehner didn't respond directly, saying, "The American people expect in Washington, when we have a crisis like this, that the leaders will sit down and have a conversation. I told my members the other day, there may be a back room somewhere, but there's nobody in it." The speaker said it wasn't possible to get a debt-limit bill through the House that didn't also include measures against the Affordable Care Act. "We are not going to pass a clean debt-limit increase," Boehner said. "The votes are not in the House to pass a clean debt limit." On the possibility of adopting such a bill to avoid a potential U.S. credit default, Boehner dismissed the idea, saying America must confront its deficit problems. "We are not going down that path," he said. "It is time to deal with America's problems. How can you raise the debt limit and do nothing about the underlying problem? " "Since 1978, we've raised the debt ceiling 55 times. A majority of those times, 28 times, Congress has attached very specific and stringent requirements, many of the most significant spending restraints, things like Gramm-Rudman, things like sequestration came through the debt ceiling. And so the president's demand — jack up the nation's credit card with no limits, no constraints — it's not a reasonable demand." "Look, it's a great question. And the reason is, if you listen to what Senator Harry Reid has said, he said that he believes that 'Obamacare' will lead inevitably to single-payer, government socialized health care. Listen, I agree this thing is going to collapse. But in the process of collapsing, it's going to destroy the private health insurance system. You've got hundreds of millions of people who right now have private health insurance that is jeopardized by 'Obamacare.' So when it collapses, I don't want it to destroy the health insurance we have now." "Listen, we did have an election. And Republicans won a majority in the House of Representatives. And the Constitution gives the House of Representatives the principle responsibility for appropriations for spending. There was a press conference last week where Harry Reid said: Who is John Boehner to decide what our priorities should be in spending? Well, he's the speaker of the House and the Constitution gives him that authority." Treasury Secretary Jack Lew on Fox News Sunday warned of serious consequences if the shutdown leads to a first-ever debt default by the U.S.
"What happens if you don't pay millions of people on Social Security?" he asked. "What happens if you don't pay hospitals and health care providers across the country? The consequences are immediate, and they're very bad. Congress needs to act." "The American economy would be well-served by getting some stability and some certainty. These manufactured crises, and this brinksmanship, over and over again, is bad for the economy." "Tuesday, I wrote to Congress saying I'd used my last extraordinary measures. I have no more. That means that on October 17th, we'll run out of the ability to borrow. We'll be left with some cash on hand. And I've told Congress it'll be roughly $30 billion. "And $30 billion is a lot of money. But when you think about the cash flow of the government of the United States, we have individual days when our negative or positive cash flow is 50 (billion dollars) or $60 billion. So $30 billion is not a responsible amount of cash to run the government on. It won't last very long."